January 2013 – George Robertson, Jason Thomson, Brian Kemp, James Carter, Iain Dunne, Franco D’Acunto, David Wright, Annabel Bartle and Patrick O’Growney are the backbone of the making group. Every possible part of the hive that can be handmade is – from the half blind dovetail joints of the brood and super boxes to the mortise and tenon joints of the hive stands. 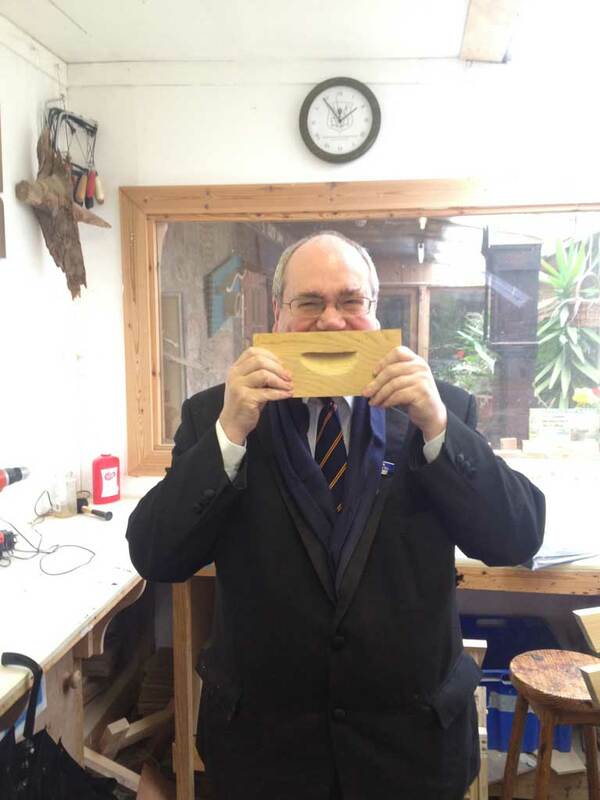 Writer James Carter is always on hand to write down his musings of our visits in the workshop…………………. “The bee-hive really is taking shape! James was involved in assembling honey-frames with a lot of help from Susan and Patrick. David Wright, James and Bryan were busy bees at chiselling into the inner corners of the hive drawers so that we could line the drawers with rails for the honey-frames to latch on to. Meanwhile, Ian was preoccupied with the stand for the bee-hive and he, David, Lucy and Annabel worked on the various segments that will fit together with fox-wedge joints, Ian and David largely chiselling, Lucy and Annabel sawing. Jason again true to form was doing something creative: a skull-like wooden sculpture, half-human, half-apelike that demonstrated his unique skill as a brilliant artist.